The consumer goods titan's capital returns will set records in fiscal 2017. The fiscal year that just closed wasn't a strong one for Procter & Gamble's (NYSE:PG) business. Organic sales fell for the second straight year to stay barely positive at 1%. The company's earnings declined as well, ticking down 2%. Yet the company plans to blow past these recent results by giving shareholders $22 billion of capital over the next 12 months. That's greater than the individual market capitalization of more than half of the companies on the S&P 500. Here's how P&G aims to pull off one of the market's biggest cash return plans. As it did in the prior fiscal year, P&G's brand-shedding initiative will provide a significant chunk of these capital return funds. The company is almost done closing the sale of its Coty beauty product line, which will raise $15 billion that it can send to shareholders -- significantly above last year's biggest brand sale, the transfer of the Duracell battery line to Berkshire Hathaway for $8 billion. Over two-thirds of the capital that P&G is returning to shareholders this year will come in the form of stock repurchases. Most of that total will happen in conjunction with the Coty beauty sale, but the company will also regularly make direct share purchases, too. 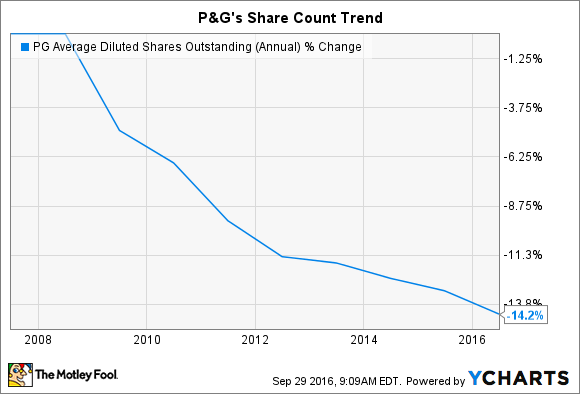 As a result, P&G's share count stands to continue falling at a significant pace -- adding to the 14% decline investors have seen over the last decade. Dividends will play a much smaller role in the return plan, given that the company just increased its payout by the smallest amount in recent memory. Income investors will receive about $7 billion in dividends this year, right on par with last year's result. P&G's dividend raises since 2003. Data source: Company financial filings. Since reported earnings are under pressure from weak sales growth and unfavorable currency exchange moves, shareholders shouldn't expect significant dividend hikes, at least until the company's payout ratio falls closer to 50% from the near 80% mark it reached last year. P&G doesn't have a comparably huge brand sale in the works for next year that would inject billions into its capital return funds. Cost cuts and a projected return to stronger organic growth will have to do most of the heavy lifting then. Still, management is confident that it will deliver as much as $54 billion to shareholders over the next three years. That implies the cash return pace will fall to about $16 billion in fiscal 2018 and fiscal 2019 from this year's record $22 billion haul.